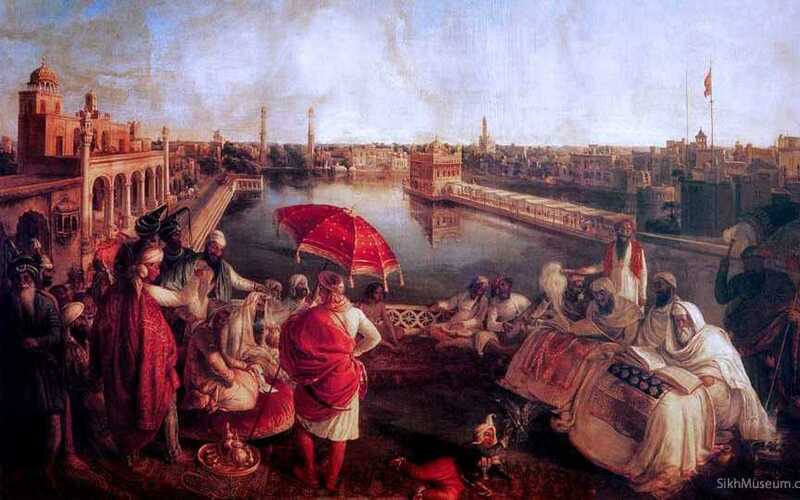 With the end of the Sikh Empire and its annexation by the British in 1849, European artist and then photographers started appearing in Punjab and visiting Golden Temple at Amritsar. The 1850’s would see the very first photographs of Golden Temple by Felice Beato and the popular paintings by artist William Carpenter. 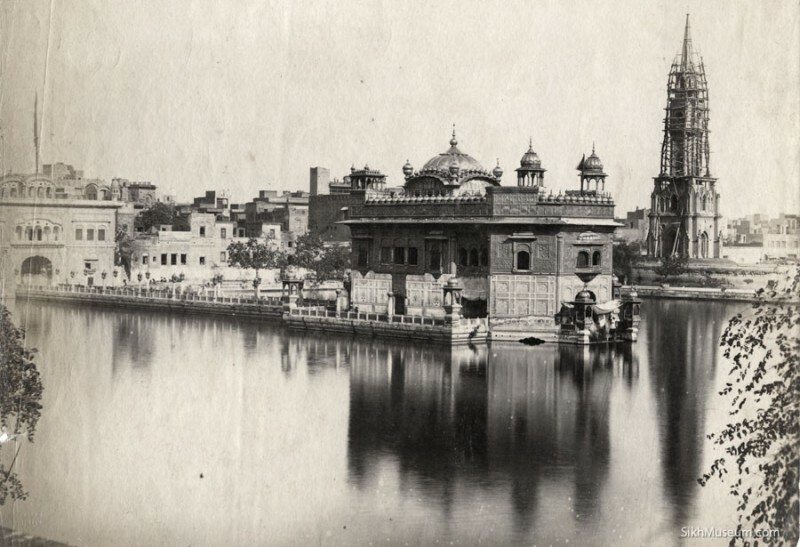 These early images of Golden Temple and early traveller’s accounts, all revealed the remarkable story of the a majestic palace which once glimmered in the waters of the holy tank at Amritsar. 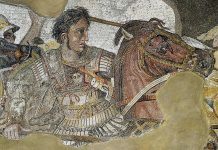 When was the lost palace built and who did it belong too? A number of historians and authors have attributed the lost palace to various figures in Sikh history, there does not seem to be any agreement among them or conclusive proof. Evidence from the French engraving of the Darbar Sahib Complex printed in 1836 indicates that the palace did not yet exist in the early 1830’s. The palace would have had to have been constructed in the time frame between the late 1830’s and before the 1841 visit of artist August Schoefft who depicted it in his epic painting of Maharaja Ranjit Singh at Golden Temple. Being the largest palace on the parkarma surrounding the holy tank, it would be logical to assume that it must have belonged to Maharaja Ranjit Singh. The Maharaja was known to move about from place to place in his vast empire and had numerous residences. Maharaja Sher Singh, the son of Maharaja Ranjit Singh was known to stay in the palace. From its origins in the last years of Maharaja Ranjit Singh rule to the end of the Sikh Empire, the lost palace continued to serve its intended purpose as a palatial residence. 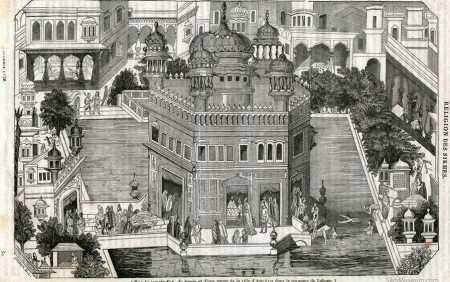 Its occupants would have had a spectacular view of the Golden Temple and the holy tank. With the rise of Maharaja Ranjit Singhs empire and its prosperity, at their height there were over 84 palaces around the holy tank. Some of these palaces (bungas) were used as centers of religious teaching and education while most served as the residences of some of the powerful and influential families of Punjab. Over time eventually almost all of the bungas have disappeared, being replaced by new structures; today the only two remaining bungas are the Akal Takht (Akal Bunga) and the twin towers of the Ramgharia Bunga. The loss of influence over Amritsar with British rule also meant that Sikhs lost control over the use of the lost palace and it was occupied by the Christian missionaries of the Amritsar Mission School. The British then converted the building into a prison, a court room, and police station. The prison remained for many years until the lost palace was demolished by British authorities to make way for gothic style clock tower in its place to dominate over Golden Temple and the Amritsar skyline. Although a clock tower traditionally has a small base, it was decided that the lost palace and all other buildings in the area would be demolished during construction to create a large open courtyard around the new clock tower. The new clock tower was designed entirely in the traditional European gothic style with red bricks and there have been some suggestions that the clock tower was built by the British as a church. 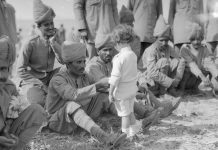 The British had no regard for the Sikh faith, their mission was to cut the roots of the faith and to convert Sikhs into Christianity.